Introducing"Windsong",a classic design by the famed naval architect, William Garden.She is a Formosa 51' staysail, ketch design. The Formosa 51` has earned a solid reputation as one of the finest, most comfortable cruising yachts to be found anywhere. "Windsong"is a prime example of just why the William Garden touch has become the symbol of quality, in cruising yachts.William Garden is quoted as saying, "I love to design boats..rather design boats that eat. ""Windsong"is a prime example of just what that meant. She has been lovingly maintained and updated by her current owner. She is being offered for sale because, she needs to be cruised and freed to explore again.Let us have the opportunity to show you just how well classic design and pure functionality can be achieved in one yacht. 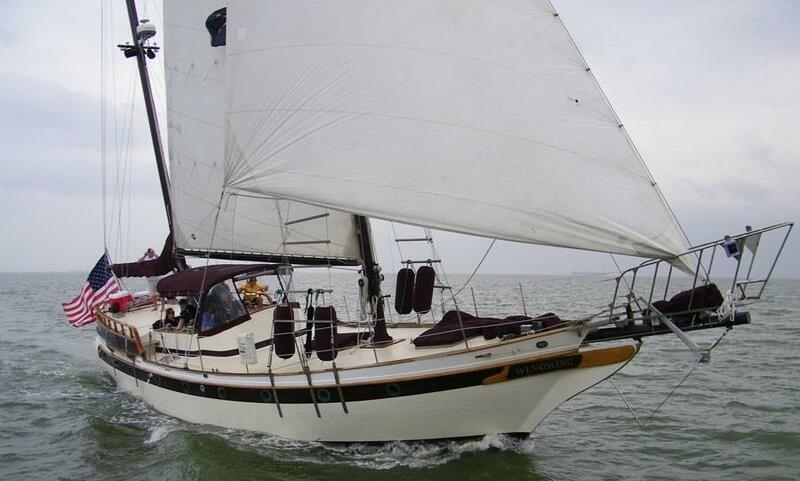 United Yacht Sales New Jersey would love to guide you through a personal showing of this 51' Formosa Ketch 1978. 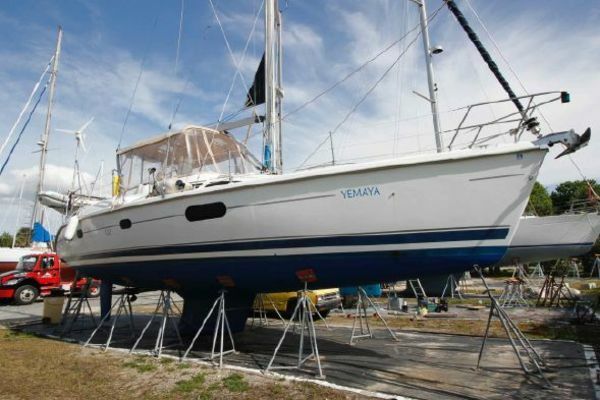 This yacht for sale is located in Houston, Texas and priced at $147,000. For a showing please contact us by filling out the form on this page and we will get back to you shortly! Windsongis noticeable when merely walking down the dock. 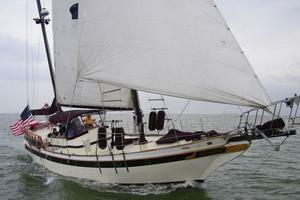 Her classic swept up bow, sporting a massive sprit , gives her away as a classic, any seas cruising yacht. Her lines and design are made for comfortable, safe cruising. The sail plan is designed to provide settings that make for safe handling in almost any sea. Her center cockpit configuration contributes to drier operation, than an aft-cockpit setup and one that makes for a more comfortable ride, when in a "pitchy" sea. BoardingWindsongis a simple step or 4 up from the dock, onto a fully fiberglass, non-skid deck. Her decks are wide and clean of any obstructions, making for easy walking, either fore or aft.The center cockpit is spacious and there is ample seating all around for guests. The cockpit has a bimini top with clear isinglass dodger, 2 drop down sunbrella panels for shade or water protection, Likewise, ALL sails,fenders,and deck hatches are covered.Going below is when the beauty and comfort of a classic Garden designed cruising yacht shines. Descending the ladder from the cockpit you find yourself in a beautiful, spacious and open design salon, galley and nav station. You will marvel at the finish and shine on all of the teak, from the sole to the overhead which is painted with cream colored awlgrip. The galley is on the starboard side and has porcelain tile countertops. The propane stove is fully gimbled and has 2 burners and a full oven The oven is in like new condition. Moving forward into the saloon, there are settees to port & starboard that is the full length that can easily seat 7 - 8 adults and can double as 2 additional berths.At the bottom of the stairs, a 180 degree turn to port will lead to the aft cabin. Along the outward run of the passageway to the aft cabin, in the top loading refrigeration & freezer for the galley. On your left, as you make your way to the aft cabin, is a walk in engine room.The luxurious aft/Master cabin has leather seating and a builtin double berth. The aft cabin head also comes with a “water closet,” in which you will find the toilet, and a full sized tub, sink with a porcelain tile counter and shower!There is ample storage, throughout. Making your way forward, on the starboard side of the passageway, situated aft of the galley, is the full stand up, walk in engine room, which also houses the electrical panel with the shore/house/generator switch.Walking forward, through the saloon, you will enter the passageway leading to the forward stateroom. It houses a v-berth, suitable for 2 adult persons and also has a head, with toilet and porcelain tile counter vanity. Entry from the saloon and forward berth.You will notice, walking though the cabins and saloon areas, an ample number of “hand holds.” Notice also that all the corners of all of the cabinetry are rounded off, for your safety, while making your way around below, in less than calm seas. 12 Volt DC poser is supplied by 4 Interstate group SRM 27 size lead acid 12 volt house batteries. Two Interstate group 31 batteries are dedicated to the main engine.Main battery switches are located in the engine space.Bus type fuses and circuit breakers in the electrical panel, also in the engine compartment, controlling both the AC and DC systems. Plus invertor.One ProNautic 12 V 50 amp, 110volt charger and one 80 amp engine alternator.There are many AC electrical panels available throughout the yacht. There were GFCI outlets well placed at engine room, weather decks, galley and heads. Hydraulic type wheel steering. Velvet drive transmission. MAST/BOOMS: Mast and booms are constructed of aluminum and wood.The main mast is rigged with double aluminum spreaders, and is keel stepped.Mizzen mast has a single spreader, deck stepped and hank on sails.